Discussions Magazine Music Blog: AZIZA: An EXCLUSIVE Q&A with Jazz legend DAVE HOLLAND! 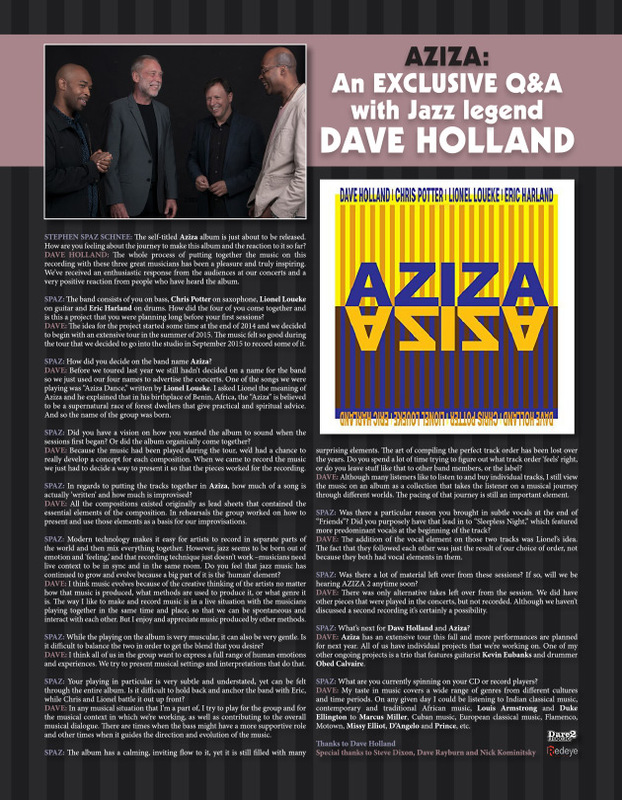 AZIZA: An EXCLUSIVE Q&A with Jazz legend DAVE HOLLAND! STEPHEN SPAZ SCHNEE: The self-titled Aziza album is just about to be released. How are you feeling about the journey to make this album and the reaction to it so far? 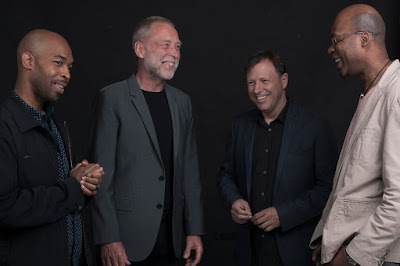 DAVE HOLLAND: The whole process of putting together the music on this recording with these three great musicians has been a pleasure and truly inspiring. We’ve received an enthusiastic response from the audiences at our concerts and a very positive reaction from people who have heard the album. SPAZ: The band consists of you on bass, Chris Potter on saxophone, Lionel Loueke on guitar and Eric Harland on drums. How did the four of you come together and is this a project that you were planning long before your first sessions? DAVE: The idea for the project started some time at the end of 2014 and we decided to begin with an extensive tour in the summer of 2015. The music felt so good during the tour that we decided to go into the studio in September 2015 to record some of it. SPAZ: How did you decide on the band name Aziza? DAVE: Before we toured last year we still hadn’t decided on a name for the band so we just used our four names to advertise the concerts. 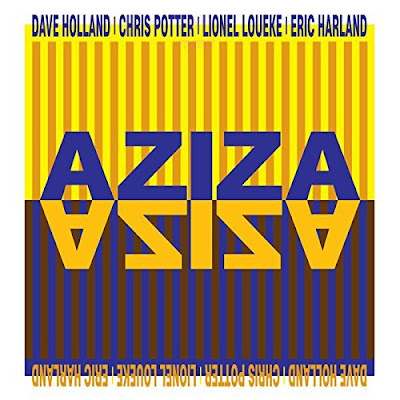 One of the songs we were playing was “Aziza Dance,” written by Lionel Loueke. I asked Lionel the meaning of Aziza and he explained that in his birthplace of Benin, Africa, the “Aziza” is believed to be a supernatural race of forest dwellers that give practical and spiritual advice. And so the name of the group was born. SPAZ: Did you have a vision on how you wanted the album to sound when the sessions first began? Or did the album organically come together? DAVE: Because the music had been played during the tour, we’d had a chance to really develop a concept for each composition. When we came to record the music we just had to decide a way to present it so that the pieces worked for the recording. SPAZ: In regards to putting the tracks together in Aziza, how much of a song is actually ‘written’ and how much is improvised? DAVE: All the compositions existed originally as lead sheets that contained the essential elements of the composition. In rehearsals the group worked on how to present and use those elements as a basis for our improvisations. SPAZ: Modern technology makes it easy for artists to record in separate parts of the world and then mix everything together. However, jazz seems to be born out of emotion and ‘feeling,’ and that recording technique just doesn’t work –musicians need live context to be in sync and in the same room. Do you feel that jazz music has continued to grow and evolve because a big part of it is the ‘human’ element? DAVE: I think music evolves because of the creative thinking of the artists no matter how that music is produced, what methods are used to produce it, or what genre it is. The way I like to make and record music is in a live situation with the musicians playing together in the same time and place, so that we can be spontaneous and interact with each other. But I enjoy and appreciate music produced by other methods. SPAZ: While the playing on the album is very muscular, it can also be very gentle. Is it difficult to balance the two in order to get the blend that you desire? DAVE: I think all of us in the group want to express a full range of human emotions and experiences. We try to present musical settings and interpretations that do that. SPAZ: Your playing in particular is very subtle and understated, yet can be felt through the entire album. Is it difficult to hold back and anchor the band with Eric, while Chris and Lionel battle it out up front? DAVE: In any musical situation that I’m a part of, I try to play for the group and for the musical context in which we’re working, as well as contributing to the overall musical dialogue. There are times when the bass might have a more supportive role and other times when it guides the direction and evolution of the music. SPAZ: The album has a calming, inviting flow to it, yet it is still filled with many surprising elements. The art of compiling the perfect track order has been lost over the years. Do you spend a lot of time trying to figure out what track order ‘feels’ right, or do you leave stuff like that to other band members, or the label? DAVE: Although many listeners like to listen to and buy individual tracks, I still view the music on an album as a collection that takes the listener on a musical journey through different worlds. The pacing of that journey is still an important element. SPAZ: Was there a particular reason you brought in subtle vocals at the end of “Friends”? Did you purposely have that lead in to “Sleepless Night,” which featured more predominant vocals at the beginning of the track? DAVE: The addition of the vocal element on those two tracks was Lionel’s idea. The fact that they followed each other was just the result of our choice of order, not because they both had vocal elements in them. SPAZ: Was there a lot of material left over from these sessions? If so, will we be hearing Aziza 2 anytime soon? DAVE: There was only alternative takes left over from the session. We did have other pieces that were played in the concerts, but not recorded. Although we haven’t discussed a second recording it’s certainly a possibility. SPAZ: What’s next for Dave Holland and Aziza? DAVE: My taste in music covers a wide range of genres from different cultures and time periods. On any given day I could be listening to Indian classical music, contemporary and traditional African music, Louis Armstrong and Duke Ellington to Marcus Miller, Cuban music, European classical music, Flamenco, Motown, Missy Elliot, D’Angelo and Prince, etc.